Johnny Marr and Ryan Jarman: Sgt Pepper or Satanic Majesties? Guitar legend Johnny Marr and his new Cribs bandmate Ryan Jarman sat down with MusicRadar in New York City the other day for an extended interview, which we will bring to you tomorrow. 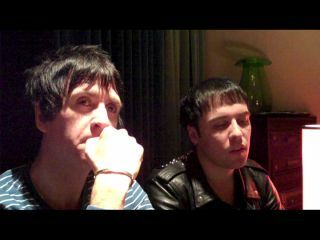 During our conversation, we touched on a wide range of juicy topics: Marr's status in The Cribs, guitar wankery (wait till you read their no-holds-barred comments), the band's engaging new album Ignore The Ignorant and how the two players avoid ego and sound clashes while recording. As you might expect, the subject of Marr's old band The Smiths did pop up. The group has recently turned down a reported $10 million offer for a reunion. Much to our surprise, however, Marr entertained MusicRadar's most generous counter-offer to get that old Smiths gang back together. In the meantime, check out the above video in which Marr and Jarman (the latter clearly in need of some double-espressos) answer reader queries and weigh in on that all-important question, one which breaks up marriages, friendships and stretches the limits of the human brain: The Beatles or The Stones?